L: 22.5" x W: 25" x H: 40.5"
Fallon Dining Chair Sophistication is served. With upholstered button tufting in white with contrasting dark wood legs, the Fallon dining chair is a daring approach to posh in the dining room. Comfortable, stylish seating invites dinner guests to linger long past the meal, they will bring their best manners to a graceful dining room. Looks like the dining scene is just what you imagined: Simply elegant. Sophistication is served. With upholstered button tufting in white with contrasting dark wood legs, the Fallon dining chair is a daring approach to posh in the dining room. Comfortable, stylish seating invites dinner guests to linger long past the meal, they will bring their best manners to a graceful dining room. Looks like the dining scene is just what you imagined: Simply elegant. I like these chairs because they conform to your bottom. Was worried about staining so bought the coverage protection. I wanted decor that was elegant with a casual theme. I bought a different table than the one that came with the chairs because I didn't want a round table. These were the most comfortable dining chairs in the entire store with great price and soft fabric. Believe me I tried them all and loved these chairs. Beautiful! Very comfortable and classy! Beautiful chair, very comfortable it makes my dinning table look very formal. Hi Lois, thank you for your review and photo! The new dining set looks great. We hope you are enjoying your new furniture! We are above and beyond pleased with our new dining chairs. They are comfortable, elegant, and gorgeous! Yes, we would recommend them. FYI- look for the legs under the chair lining which is sealed and hidden upon delivery. We thought they were missing but found them eventually, haha. Love them. wonderful, sturdy, beautiful and comfortable. Can't beat the price! Ordered a similar chair from another company however, I had to struggle to return them by myself. They were too low and did not feel comfortable like these chairs. The color and the style of the chairs add more elegance to the dining room. so chic. almost exact copy of the similar chair at _______ Barn. Super comfortable. make dining room look like i spend a fortune! These chairs are amazing! Hubby used scotchgard on them for lasting protection because of the light ivory color. Very nice chairs. Great quality for the $. They arrived at the store when promised. 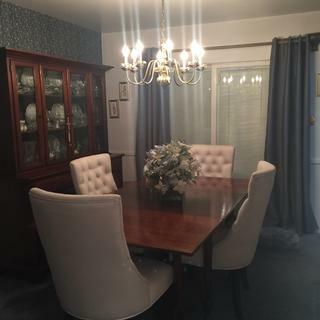 We’ve looked all over Rochester for dining chairs-even willing to pay $800-1000/ chair. We needed 8 chairs. We saw these chairs and thought for the price how good can they be? These are excellent! Very well made very comfortable and at a great price-best value in town. Along with our excellent salesperson, Robert C., we are very satisfied. So comfortable we've found ourselves sitting around chatting after eating. Great purchase, so happy! We're thrilled you're happy with the Fallon dining chair, thanks for sharing! We purchased two of these for our farmhouse dining set, they are the perfect addition and so comfortable! The chairs look beautiful around my round dining table. I’m concerned about the white color getting dirty but we bought the protection plan, so hopefully they’ll take care of any stains. The chairs were very firm when they just arrived but have gotten more comfortable over the last few days. It feels like I’m sitting on a mini sofa, really comfortable. Beautiful and luxurious Fallon chairs! 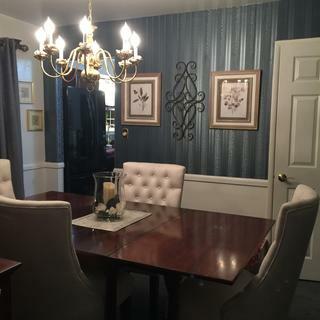 I really loved and recommend this Fallon dining chairs because it makes your dining room look luxurious for less money. 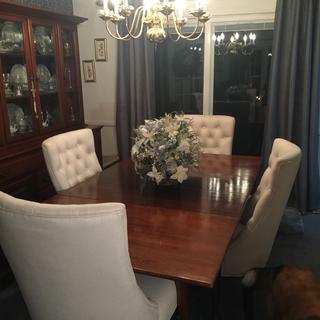 I loved the quality, color and material of the chairs but i will suggest to first measure the size of the chairs that will better fit your dining table because in my case the chairs was bigger than the table size. Other than my not so good experience with the size i totally recommend these chairs. Does this chair come in other colors or fabrics? BEST ANSWER: The Fallon Dining Chair is available in the ivory upholstery only. I would call it a light cream as opposed to a bright white. This is closer to an ivory/cream. I hope this helps. Its lighter that regular ivory/cream, almost white. Is the fabric more like linen or microfiber? BEST ANSWER: Definitely nothing like linen. More like cotton or microfiber. They are beautiful chairs. Hold up well. I’ve had for 2 years now. Look just like Pottery Barn chairs that are very expensive. Thank you. This is helpful. I was hoping for microfiber or velvet, as it’ll make the chairs easier to clean. You’re welcome. They are pretty close to microfiber and just as easy to clean. My kids haven’t ruined them yet. It’s more like a linen cotton blend and they are quite beautiful and comfortable! Are they easy to clean and spot treat stains? I haven’t had to clean them just bought them 2 months ago. More linen. Not microfiber look or feel. Not as "rough" as linen. Can I get samples of the fabric to protect the head rest? BEST ANSWER: Fabric swatches are not available for this collection. Is it possible to get chair covers to protect them? BEST ANSWER: Chair covers are not available for the Fallon Dining Chairs.